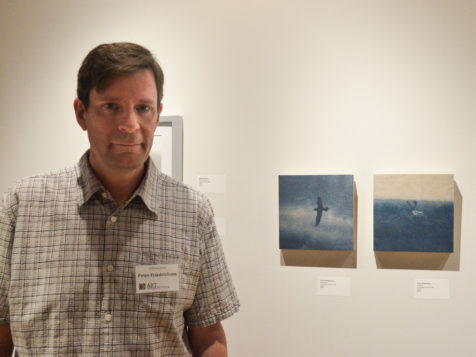 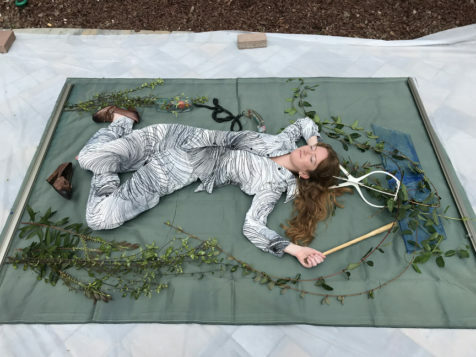 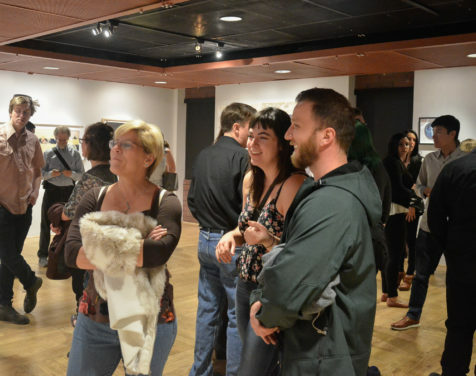 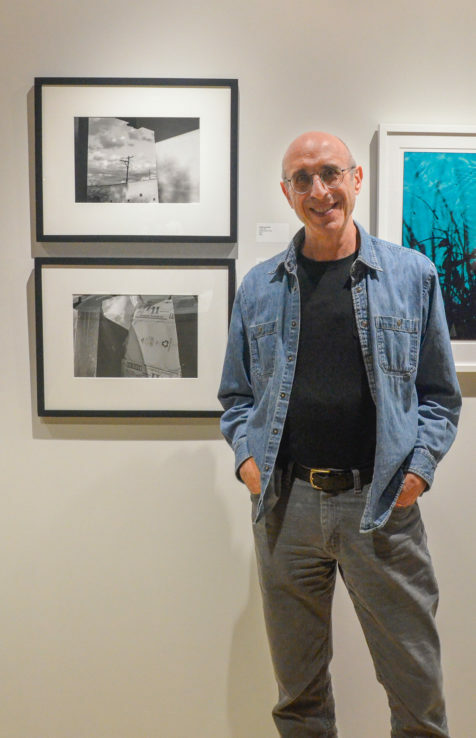 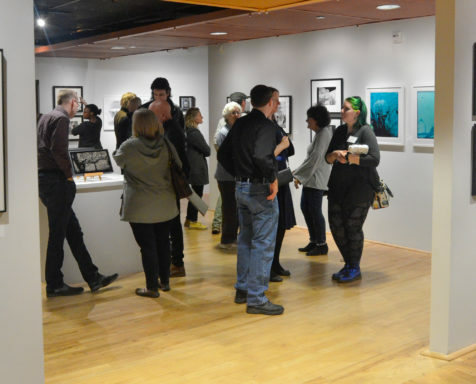 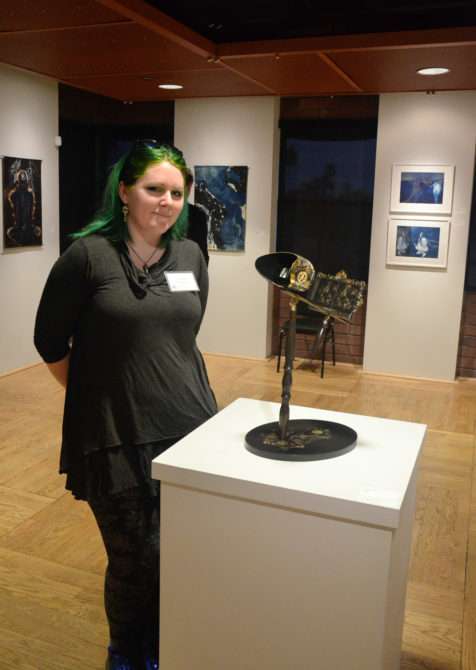 This past weekend of September 12 and 13 Art Intersection was bursting with color! 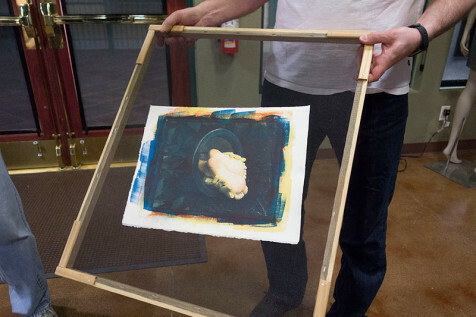 Tri-color gum bichromate, that is. 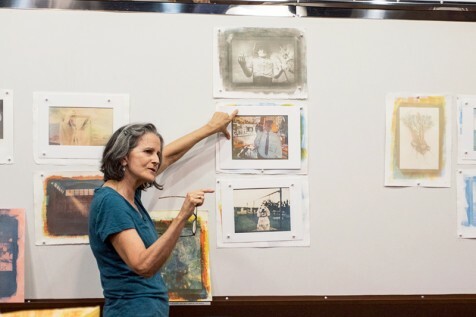 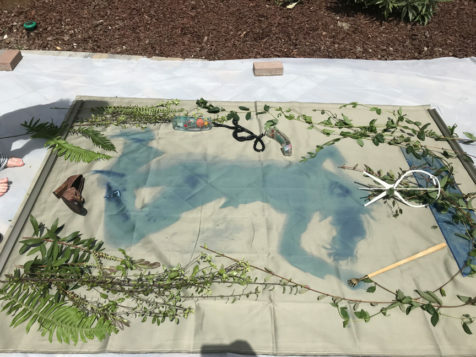 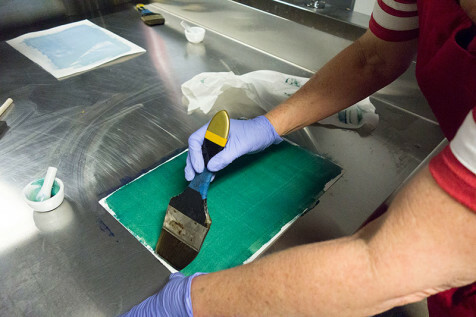 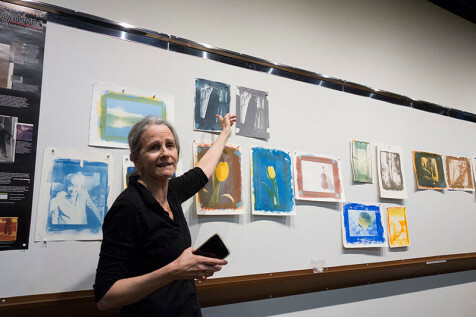 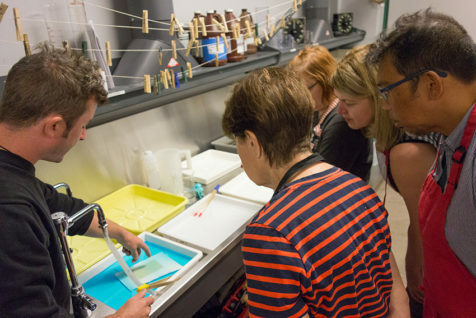 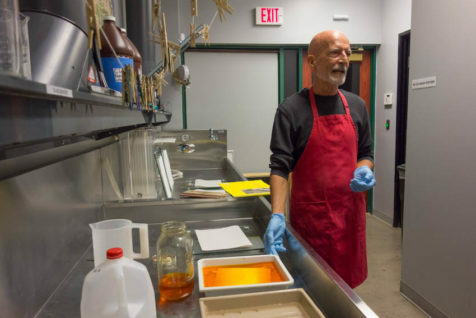 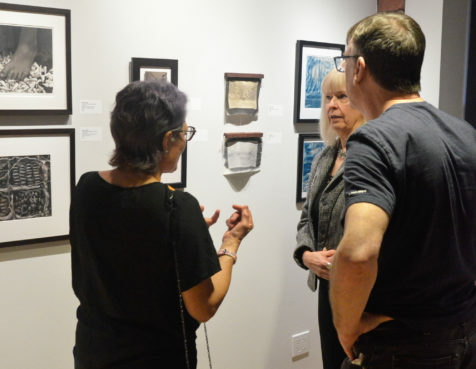 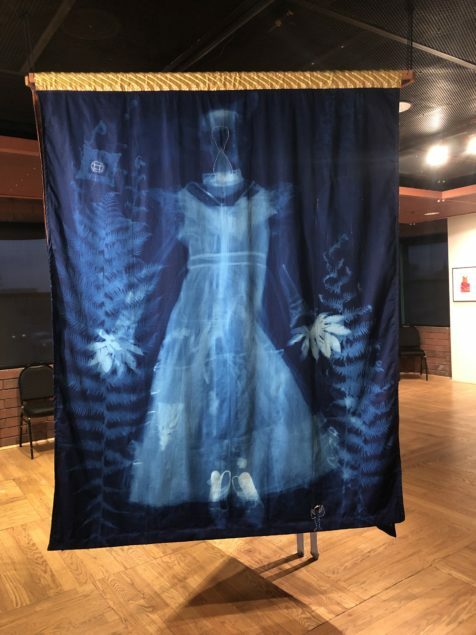 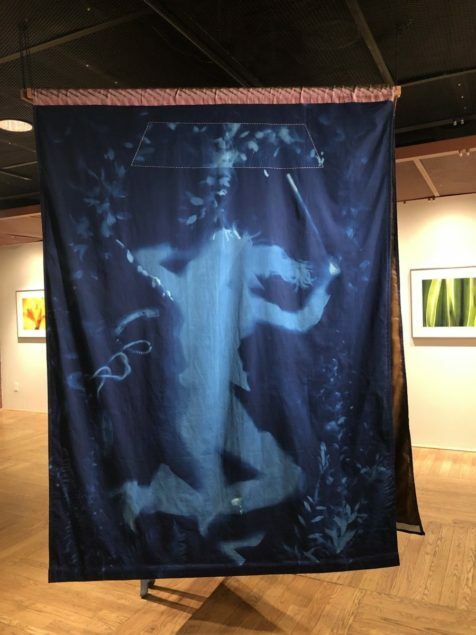 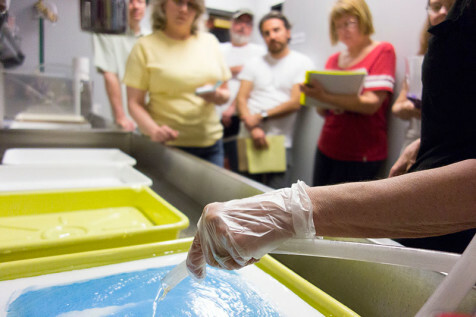 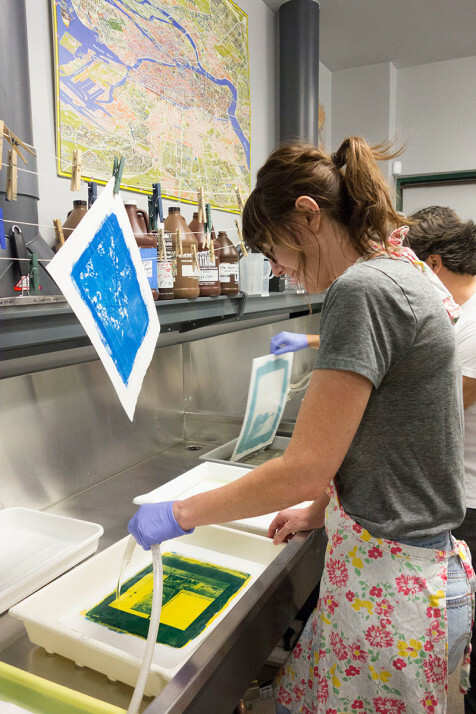 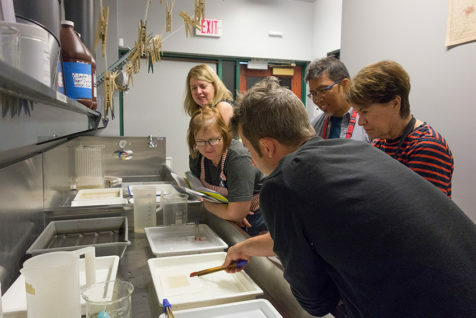 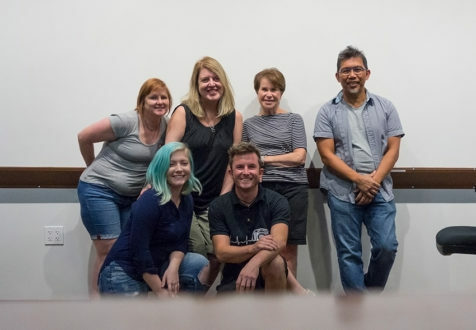 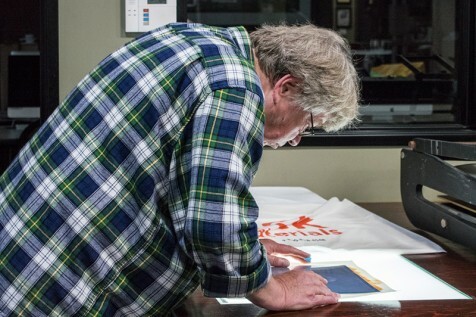 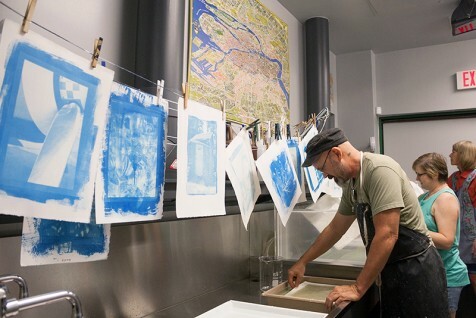 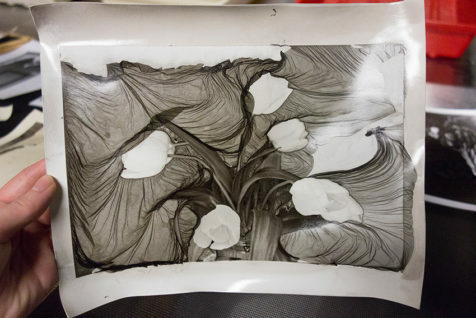 We had the great pleasure of hosting a two-day, immersive workshop in the process taught by Diana Bloomfield, a master gum printer especially known for her tri-color technique. 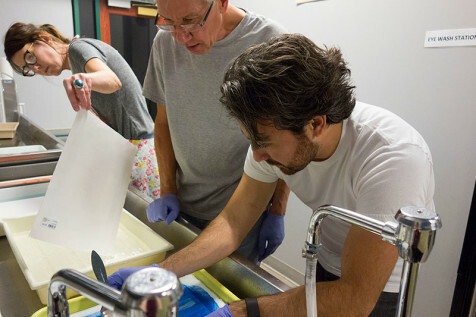 Ten participants learned about this fascinating 19th-century process that includes mixing together gum arabic, potassium dichromate, and watercolor pigments, then hand-coating that mixture on paper, exposing their paper under a digital negative in UV light, and washing out the print in water to “develop” it. 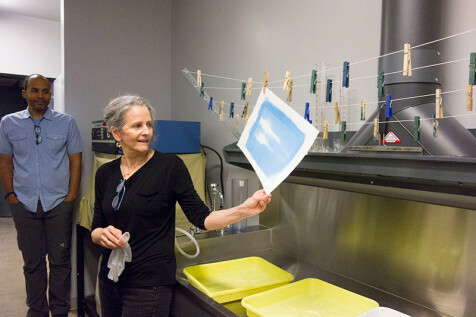 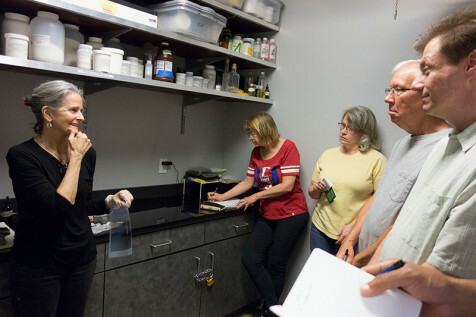 Diana Bloomfield explains her technique for mixing the gum emulsion on Day 1. 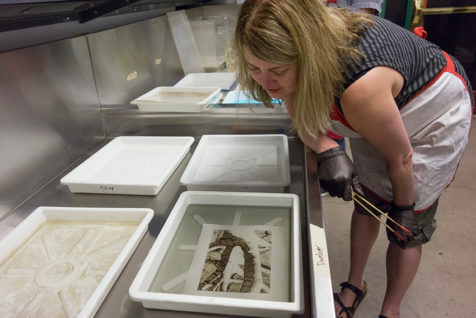 Workshop participants look on as Diana coats a sheet of paper with the light-sensitive gum mixture she’s made. 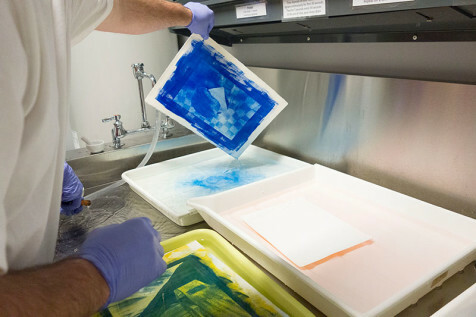 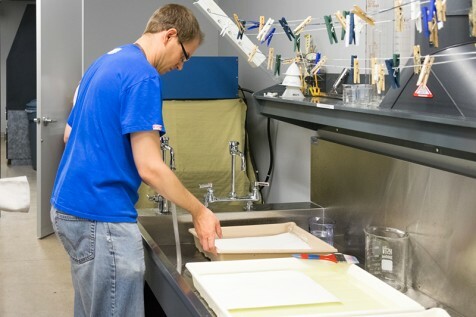 Any color watercolor pigment can be used, but this tri-color process involves making three separate coating and exposure runs with cyan, magenta, and yellow pigments individually to get a full-color final print. 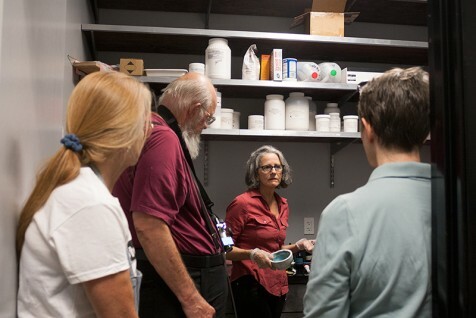 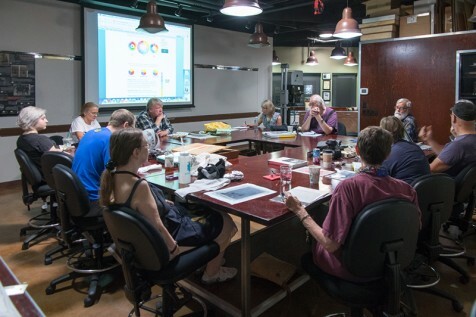 Armed with coffee, the participants listen as Diana explains the basics of color balancing for a natural-looking print at the start of Day 2. 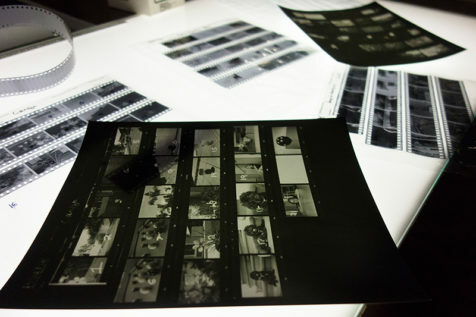 If a print does not initially look correct, more passes with various colors can be made to balance it. 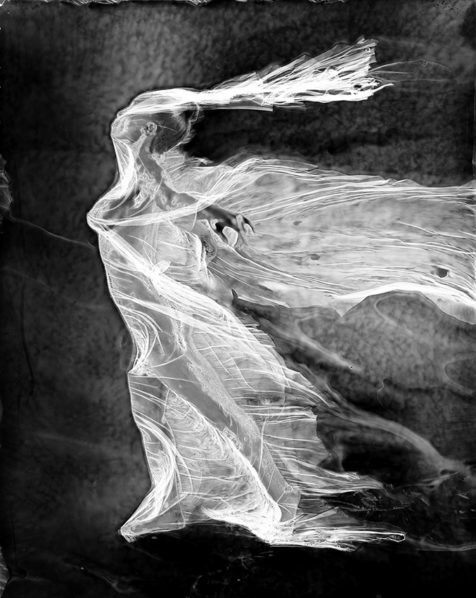 In order for the image to remain sharp, the negative being used must be placed in exactly the same spot for every layer. 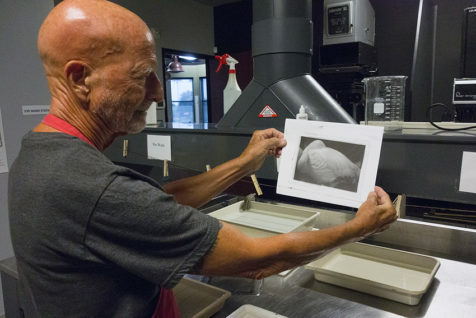 Michael Puff carefully registers his negative to exactly match the previous layers he’s created. 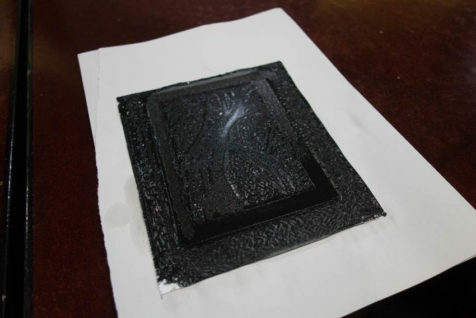 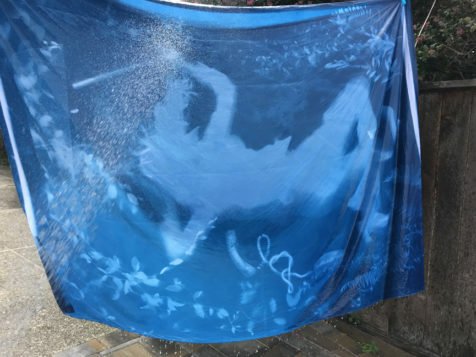 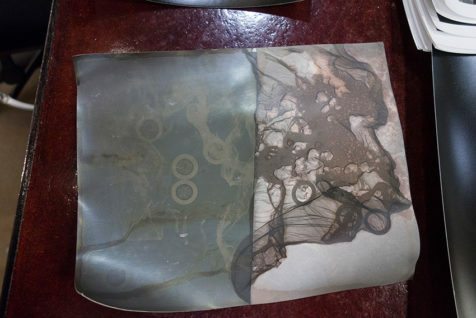 Chris Palmer rinses out his print after exposing it to UV light. 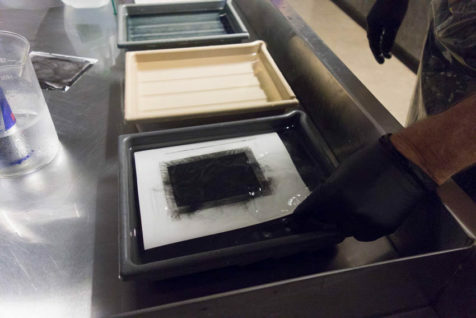 During the exposure, the areas of the gum emulsion blocked by the dark areas of the negative wash away in the water, creating highlights. 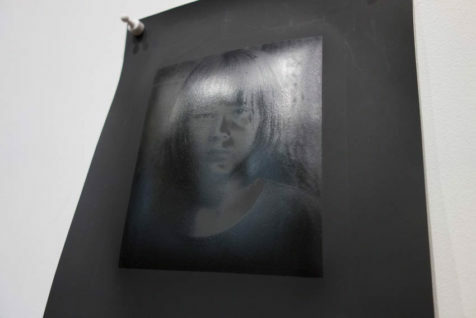 Those underneath the light areas of the negative solidify and adhere to the paper, creating shadows. 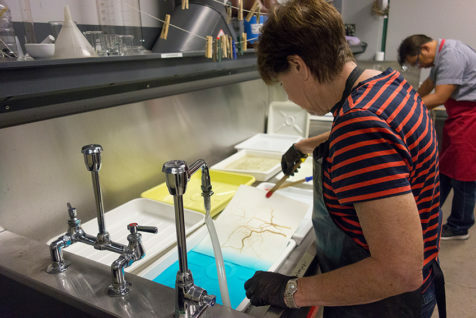 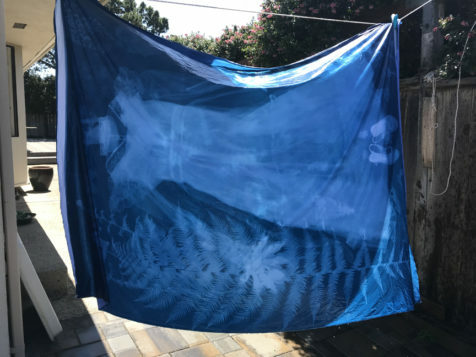 BK Skaggs, Shari Trennert, and Maylee Noah rinse their prints while others hang to dry. 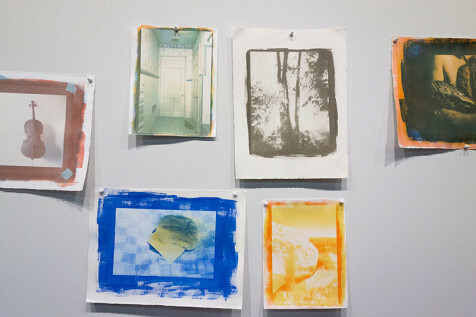 These prints show the first pass with the cyan layer. 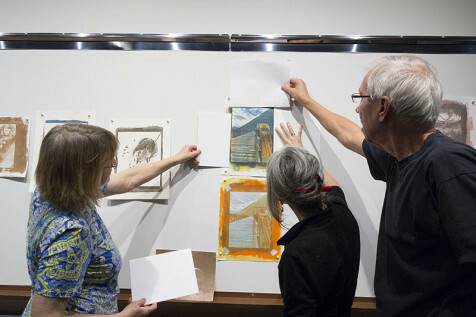 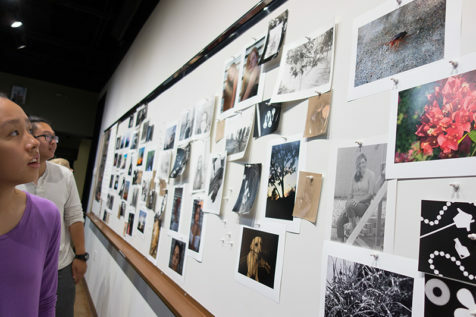 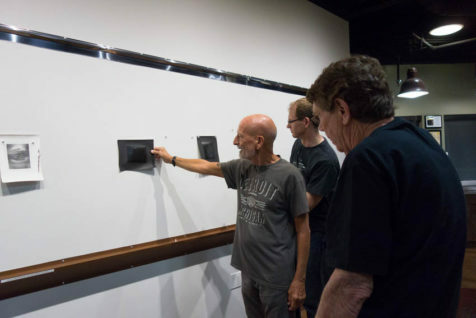 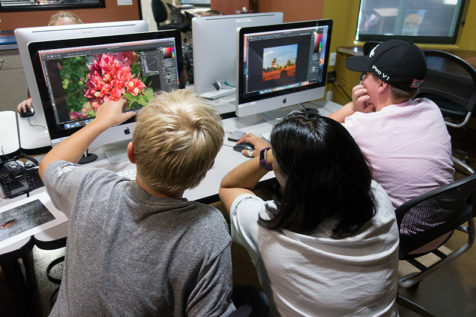 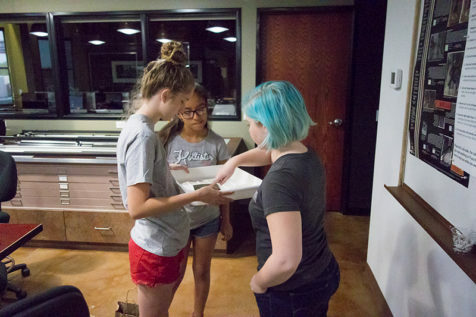 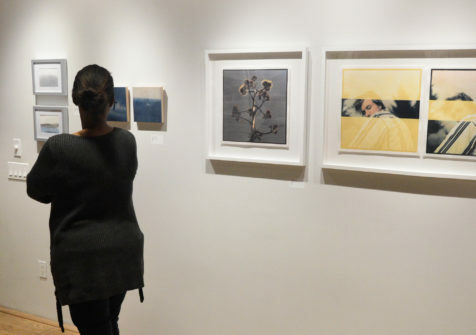 At the end of the workshop, all the participants show the results of their hard work by putting their favorite prints up on the critique board. 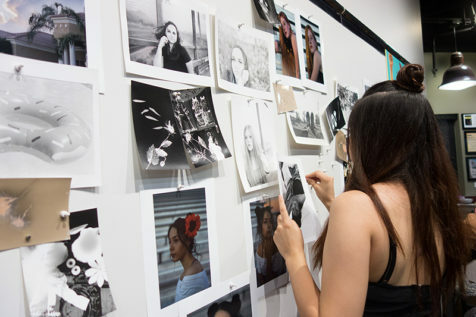 Diana gives the class constructive feedback on their printing. 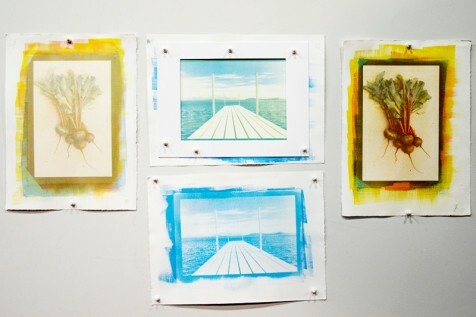 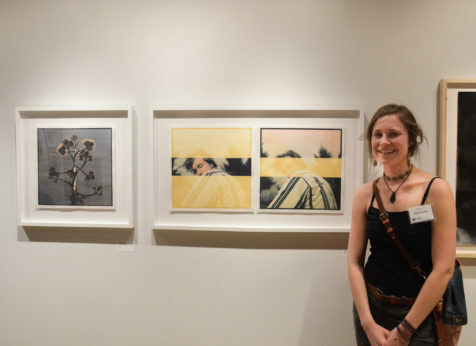 Finished prints by Maylee Noah showing one-color, two-color, and tri-color prints. 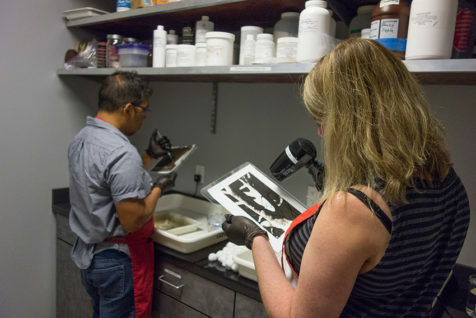 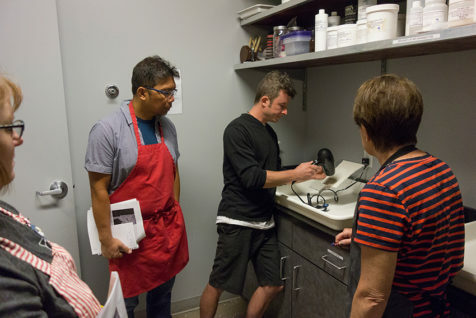 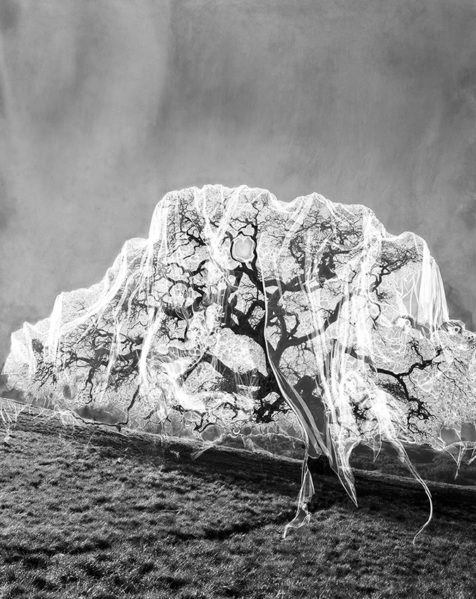 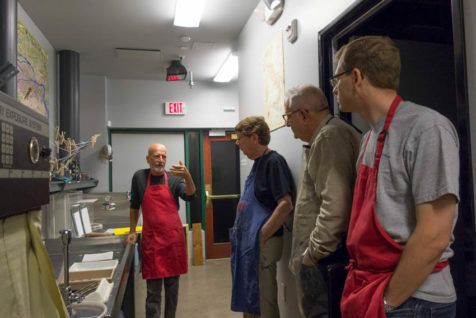 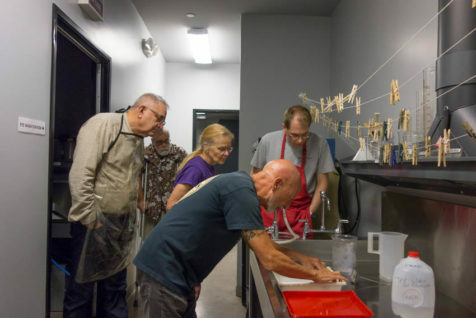 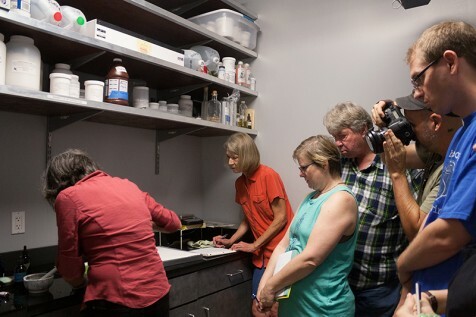 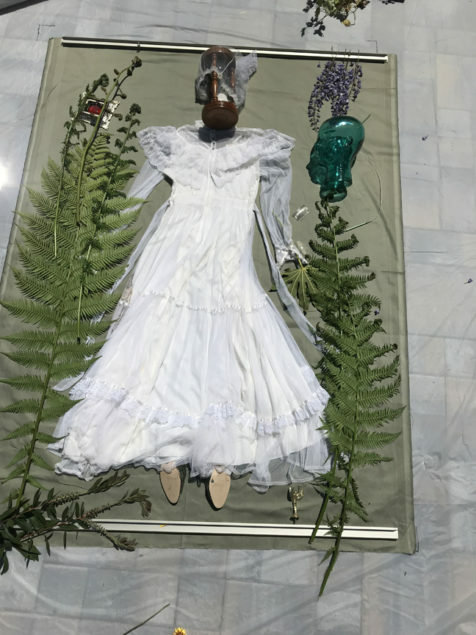 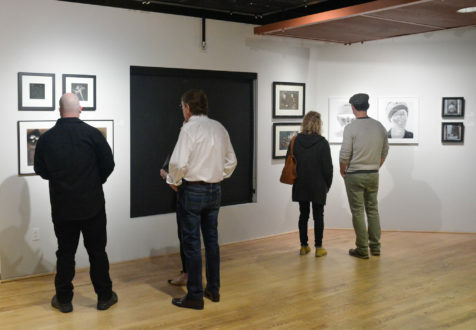 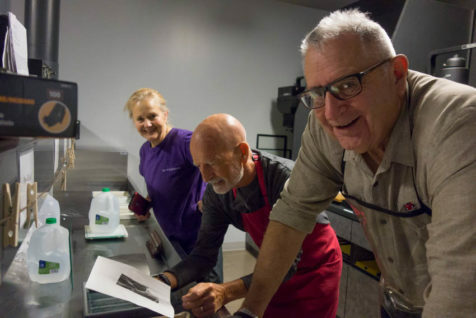 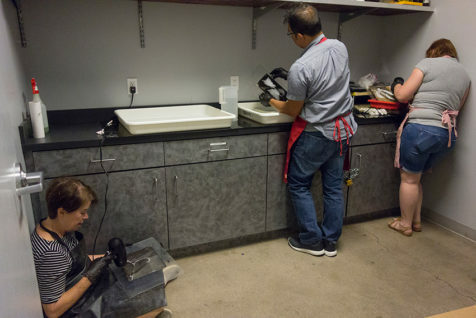 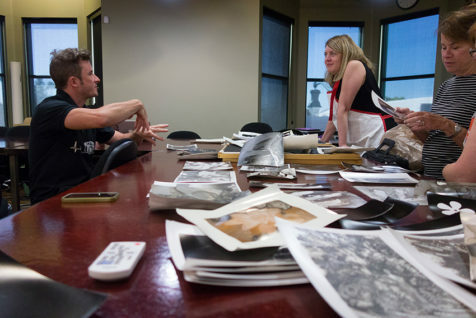 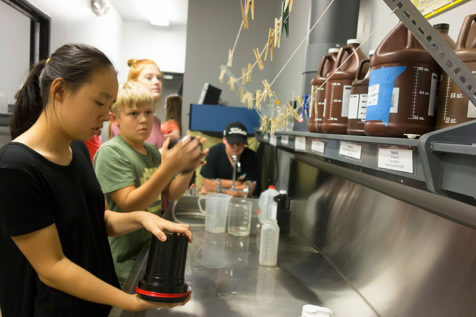 This is a follow-up lab for participants of the Ambrotye Workshop at Art Intersection wanting dedicated time to practice glass plate photography under the assistance of Claire Warden. 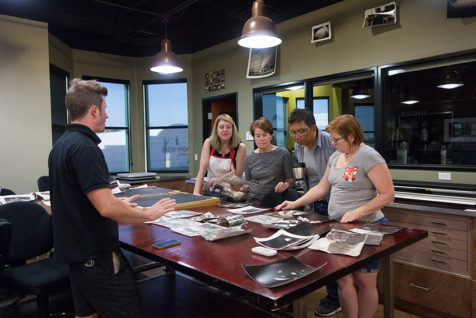 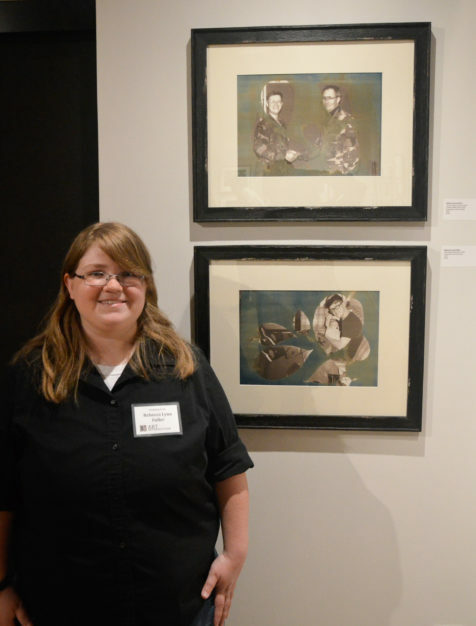 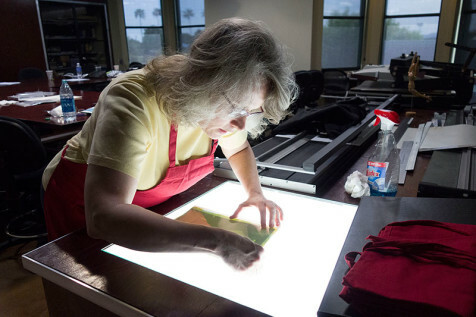 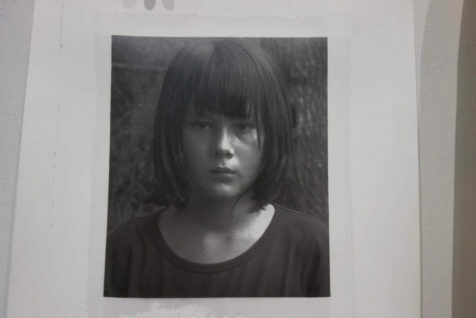 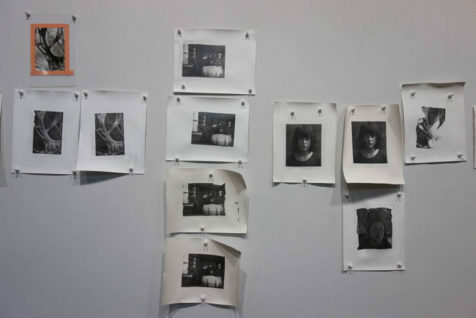 Claire will be available to answer questions and help you create your own ambrotypes. 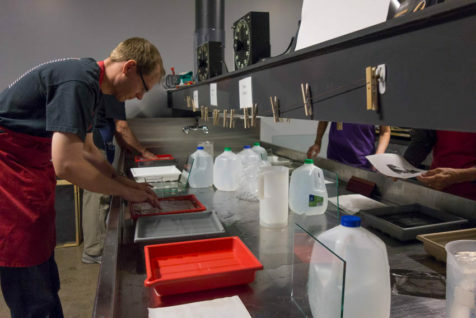 Glass plates for this open lab day must be purchased at Art Intersection, 4″x5″ plates for $5 each or 8″ x 10″ plates for $20 each. 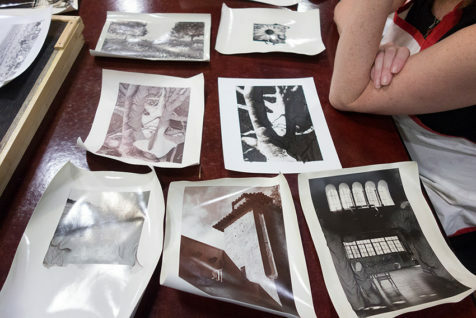 These plates fit the carrier for the Art Intersection 4×5 and 8×10 cameras, or you can bring your own camera. 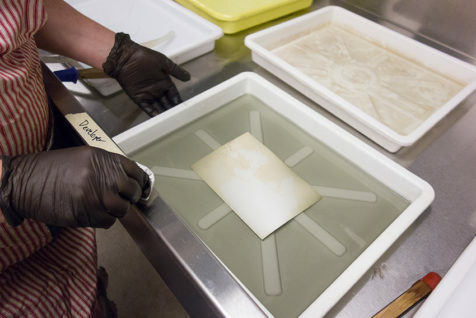 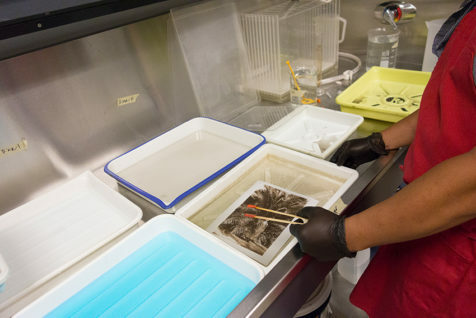 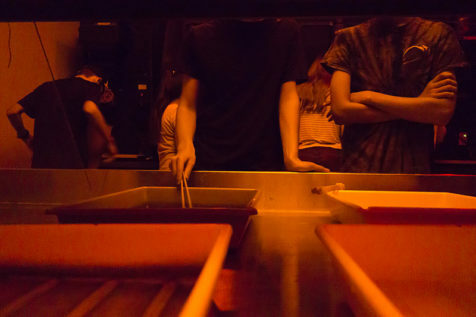 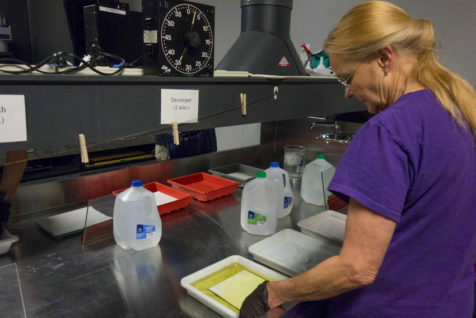 Collodion chemistry is included in the price of the glass plates. 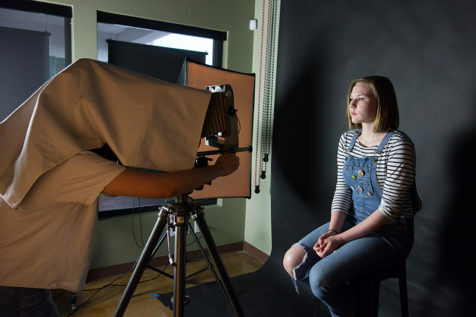 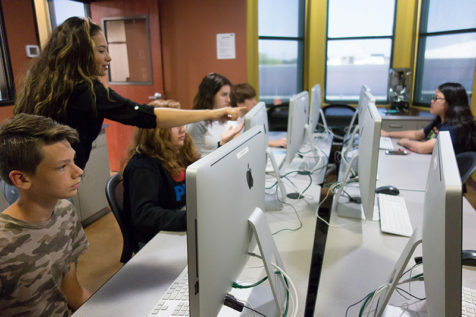 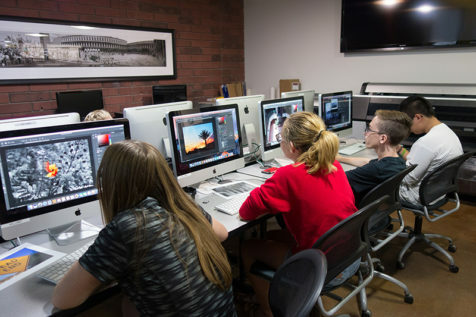 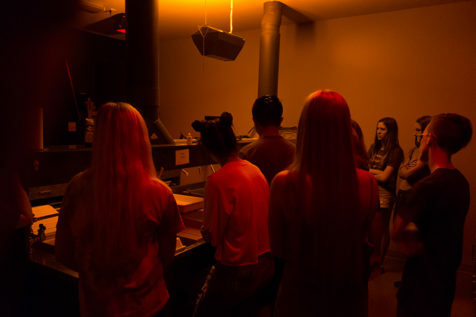 The lab includes softbox continuous lighting in the studio.